As Donald Trump does a victory lap as he takes the Republican nomination for President, the movement against his populist nationalist rhetoric has been increasing in intensity. The recent stop in Albuquerque, New Mexico saw people flooding the street looking to shut down the event just like they did in Chicago and promised to in Vancouver. On Tuesday, May 24, 2016, hundreds took to the street to reject Trump’s racism, xenophobia, and misogyny. Albuquerque residents used a diversity of tactics to make their voices heard, ranging from holding signs and chanting to throwing rocks at the cops defending the Trump rally and attacking protesters. 4 people were arrested during the protests: 2 adults and 2 minors. In the aftermath, APD is attempting to track down 30 “thugs” the department claims committed crimes on May 24. They released photos of suspects, targeting and profiling Latino youth. APD says they are waiting until they have built air-tight cases to begin their arrests, so we don’t know who or how many people will be arrested. The money we raise will be used for legal expenses for anyone charged at the Trump protest in Albuquerque. As this unfolds, we need to be prepared to provide money for bail, legal fees, and if possible, legal representation. Donald Trump joined in with the Albuquerque Police Department in calling the protesters thugs, and honed in on the fact that Mexican flags were present. This is intended to signal to his base that the protesters were “not one of us” and have an “allegiance to Mexico,” which will play into the right-wing narrative that Mexicans are “colonizing” the American Southwest. The police treated the protesters with violence, using smoke grenades against the crowd. They said that this was in response to rocks, plastic bottles, and burning t-shirts being thrown at officers. Several protesters were able to get inside with banners reading things like “We’ve heard enough” and “Trump is a Fascist.” Some of the 4,000 Trump supporters chanted back “Build the Wall!” in response. At the end of the event, the convention center had its glass doors smashed and Trump’s speech disrupted. They need donations to go directly to those who need legal support and are facing legal charges due to protest actions. Though there are four in custody, the Albuquerque Police Department is committed to going after other people in the region. 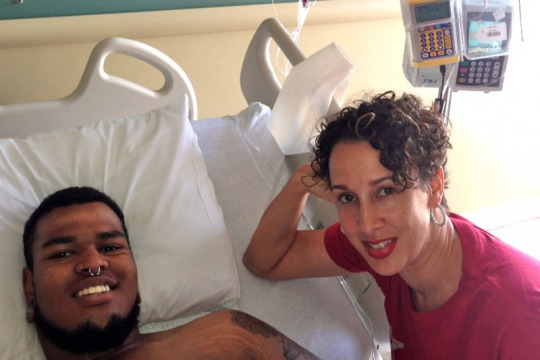 Jeremiah, who was helped by the fund for his medical bills, was stabbed by two neo-Nazis after he confronted their racist behavior. Anti-Fascist organizing, both in the U.S. and internationally, has always been a controversial and confrontational affair. The primary tool here is to do what can be done to deny fascists and racists to have a platform, which means counter-demonstrations, disrupting events, challenging them in public, creating community movements to counter them, and a whole other range of tactics and strategies. Because it has this huge range, there are militant components that have been crucial to the success of keeping the reactionary forces from having their day. This means that there is important need to both support Anti-Fascist prisoners and those attacked by Nazis, as well as the basic funds needed for ongoing organizing. As right-wing organizations grow in response to changing demographics and economic collapse, we have to fight for a future before it resolves into radicalized barbarism. Because of this, we are doing a call out to support the International Anti-Fascist Defense Fund, a project that raises ongoing money to support these projects. 2) Sergi is a Spanish anti-fascist currently facing a lengthy prison sentence for defending himself at a protest against a neo-nazi concert. 3) Stephen was charged with “breach of peace” for standing up against a KKK rally in Columbia, South Carolina, USA in July. 4) Eddien was also charged with various “crimes” for confronting the KKK at the same action Stephen attended. Eddien was just released after reaching a plea deal with prosecution! 5) Jeremiah was at a concert when two neo-nazis showed up and started making trouble. Jeremiah confronted them and was nearly stabbed to death by one of the racist scumbags. 6) Paul is a German anti-fascist who was arrested at a July anti-Pegida action for the “crime” of carrying a flag with a flagpole the police was decided was “too short.” He was just released from prison and is now serving a probationary sentence in the community! 7) Maxime Bugsel, a 19-year-old French antifascist, was shot to death in the early morning hours of August 29th in Bruay-la-buissière. We contributed to the funeral costs and to help out his family. We’re proud to be able to help anti-fascists and anti-racists all over the world when they need real solidarity and support the most! JOIN US BY DONATING! Go ahead and click here to be taken to the fundraising page, and share it around as widely as possible!